eastern sicily is renowned for baroque architecture. especially, baroque balconies. 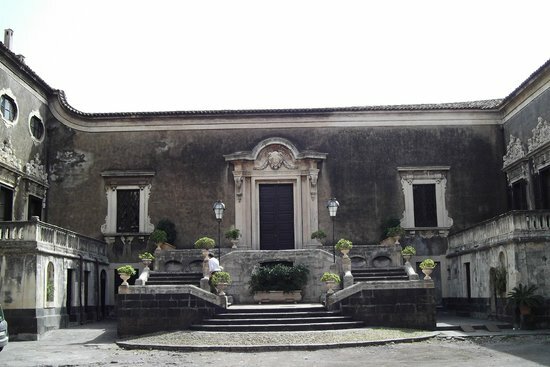 many of the medieval cities in eastern sicily, including catania, siracusa and ortigia, noto, modica, and ragusa, were relocated or rebuilt following a devastating earthquake in 1693.
palazzo biscari, considered the finest private building in catania, was built following the earthquake, between 1702 and 1763, by the paternò castello family, who still own the baroque palace. …but also, for the rococo ballroom in the eastern wing that has painted and parcel gilt wall panels and a fresco ceiling depicting the banquet of the gods, the glory of the family biscari. the palazzo biscari ballroom is often described as the finest rococo room in italy. our private tour of palazzo biscari, guided by a member of the paternò castello family, was one of the highlights of our trip to sicily. our guide was a most enthusiastic historian, who appreciated an interested audience. in the portrait gallery, he even posed in front of a portrait of one of the princes of biscari so that we could see how much he looks like his ancestor. especially, in profile! 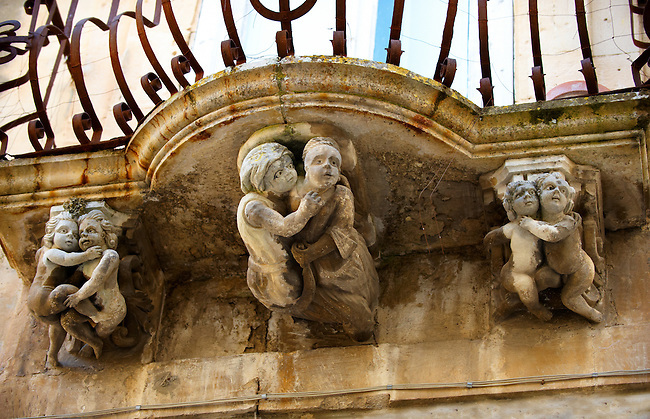 the palazzo nicolaci di villadorata in noto was built during the same time period as the palazzo biscari, between 1701 and 1765. the palazzo nicolaci is most famous for its six baroque balconies with anthropomorphic corbels. the palazzo nicolaci balconies are considered iconic examples of sicilian baroque architecture. and, symbols of the eight late baroque towns of the val di noto (noto valley), which are included on the UNESCO world heritage list. typically, sicilian baroque balconies have carved corbels and ‘goose breast’ wrought iron railings, which were supposedly designed to accommodate the full skirts of 18th century women’s dresses. some palazzos are in better condition than others. did you notice the corbel in the lower right corner? 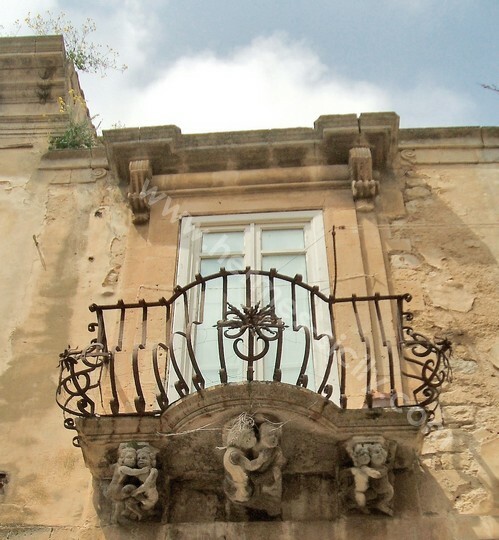 many sicilian baroque balconies have figural brackets. but, many more have volute or scroll shaped corbels. where to find baroque balconies in eastern sicily. and, some other scenic places to visit. when you go on vacation, do you ever book a room with a view? how about a room with a site? during our recent vacation, my husband, bob, and i stayed at an extraordinary hotel in southeastern sicily. a hotel with an archaeological site. the eremo della giubiliana, which has been an agricultural settlement since the greeks colonized sicily during the 8th-3rd centuries BCE, has an archaeological park. the site of a greek necropolis (cemetery) from the 5th-2nd century BCE. we knew that we were staying somewhere special, when upon our arrival, we were greeted at reception by angelo, the general manager, and a waiter with a silver tray holding two glasses of cold latte di mandorla (almond milk), a traditional sicilian summer beverage. then marco, the concierge, showed us through the courtyards to our (upgraded) room, the suite della guardia. during the 12th century, the eremo della giubiliana was part of an ecclesiastical feudal estate. the oldest existing part of the convent, the square stone watch tower, was built during the 15th century when the building was used as a fortified rural residence. the knights of the order of saint john (san giovanni) from malta occupied the convent during the first half of the 16th century, when the suite della guardia was used as the guards room. did you notice the date of 1536 inscribed into the stone plaque above the bed? during the 18th century, a landed aristocratic family purchased the estate. the nifosi-mancini family has owned the eremo della giubiliana since then. the present heiress, lady vincenza iolanda nifosi, decided to restore the convent for use as a five star luxury hotel, which opened in 1997. her son, who is an architect, designed the restoration project. she resides on the estate. and, she and her family manage the estate holdings. did you notice the flag flying from the 15th century stone watch tower? and, herb and kitchen gardens. the cuisine at the restaurant, don eusebio, which is located in the former 16th century refectory, features seasonal estate grown and local organic produce, fresh seafood, and wild game. in addition, chef peppe cannistra offers sicilian cooking courses and oversees the don eusebio workshop, which makes tenute eremo della giubiliana estate grown products. the breakfast buffet featured house made marmalade, freshly baked brioche, fresh melon and figs, and freshly squeezed fruit juice. one of the best buffet breakfasts that we’ve ever had at a european hotel! we would have loved to bring home some of the tenute eremo della giubiliana marmellata di arance amare (bitter orange marmalade). there are so many outstanding restaurants in southeastern sicily, that bob and i decided to dine out. pietro leemann, the chef at joia, one of our favorite restaurants in milan, highly recommended some sicilian restaurants where some of his former sous chefs are now chefs. david tamburini at ristorante la gazza ladra in modica. and, accursio craparo at accursio ristorante in modica. according to giorgio locatelli, the chef at locanda locatelli in london, pino cuttaia could be considered the best chef in sicily. so, we also had lunch at ristorante la madia in licate on the way back from the valle di templi in agrigento. lorenzo, the concierge who booked our restaurant reservations, and angelo (the general manager) were most interested in our restaurant reviews! it’s a good thing that the eremo della giubiliana is conveniently located near the archaeological sites in agrigento and piazza armerina. and, the baroque towns of ragusa, modica, and noto. we cover a lot of territory when we travel. while we were in sicily, we drove 2000 kilometers (1250 miles)! 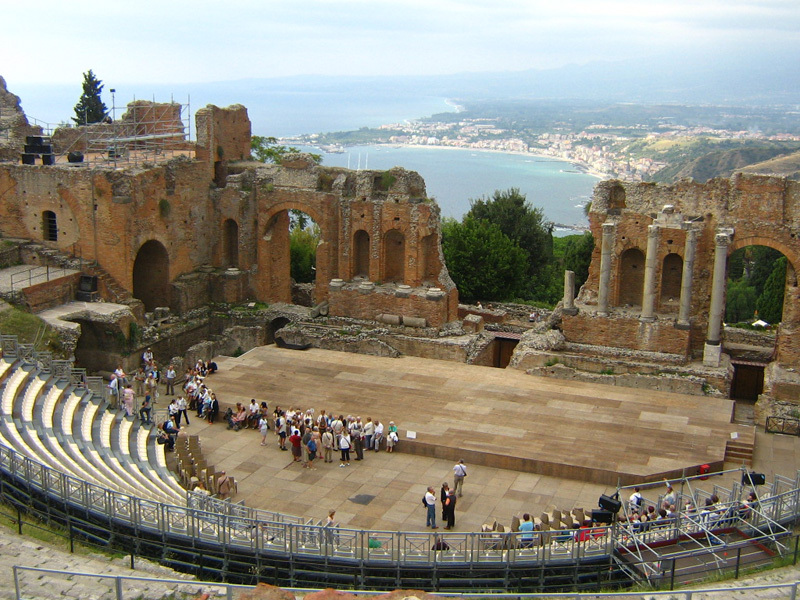 did you know that some of the most well preserved examples of ancient greek architecture are located in sicily? the greeks colonized sicily from around the 8th-3rd centuries BCE. so, my husband, bob, and i were excited to visit some of the greek archaeological sites during our recent vacation to sicily. in ancient greece, there were two kinds of sacred buildings, theaters and temples. in the theaters, the ancient greeks held celebrations in honor of dionysus, the god of wine. greek tragedy developed from these celebrations. 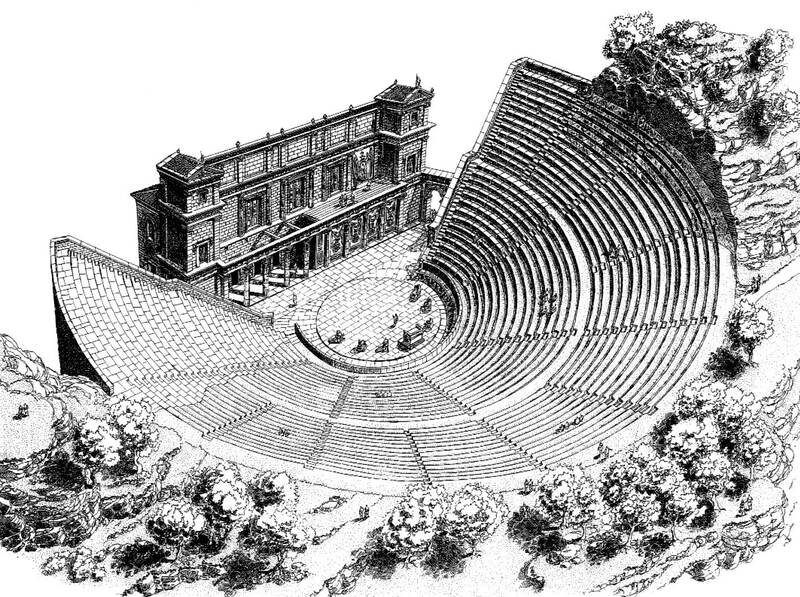 stone theatres were built in a semicircular shape, with tiered ledges for seating (cavea or theatron) surrounding the stage (orchestra), where the altar of dionysus (thymele) was located. the chorus entered from either side of the stage and surrounded the altar. the backdrop for scenery (proscenium) and the backstage (skene) were located behind the orchestra. the natural surroundings also acted as scenery. in the temples, the ancient greeks held rites and sacrifices in honor of a god or goddess. at the heart of the temple, an oblong chamber called the cella housed a statue of the god or goddess. the pronao (antechamber) was located in front of the cella. while, the opisthodomo (treasury) was located behind it. a peristyle (colonnade) surrounded the building, which was constructed on a stepped foundation. 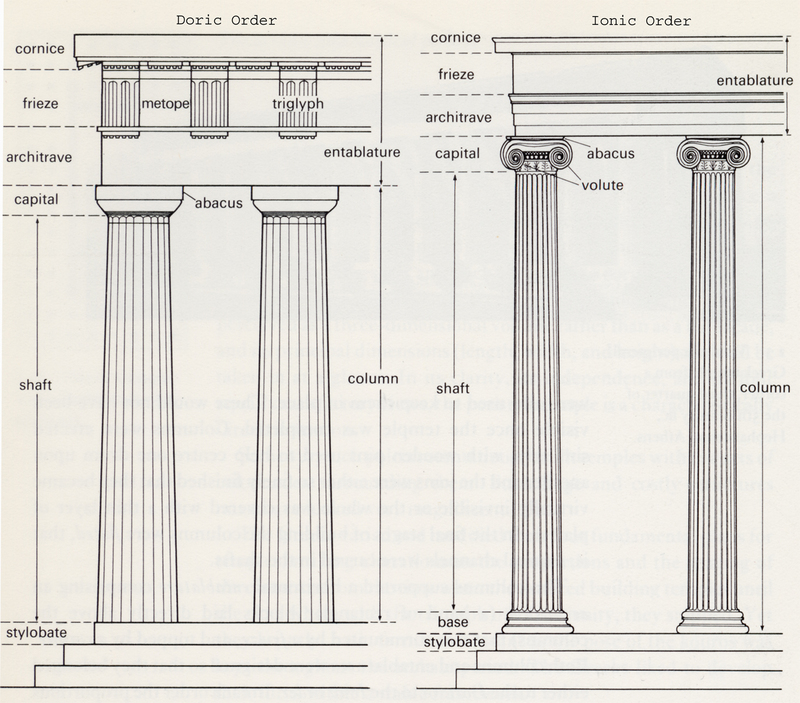 the columns, which supported the architrave (main beam) were erected on the stylobate, the highest step of the foundation. some of the most extraordinary existing doric temples are located in sicily. the valle dei templi contains more monuments, including some temples that remain in ruins, and one temple that was reconstructed during the 19th century from architectural elements of different periods. and, a garden, originally planted around 500 BCE, that has been restored by the fondo ambiente italiano (fai), the italian national trust. if you need a break from the tourist filled archaeological park, you can stroll through the five hectare (12 acre) giardino della kolymbetra, which is located on the south side of the valle dei templi. 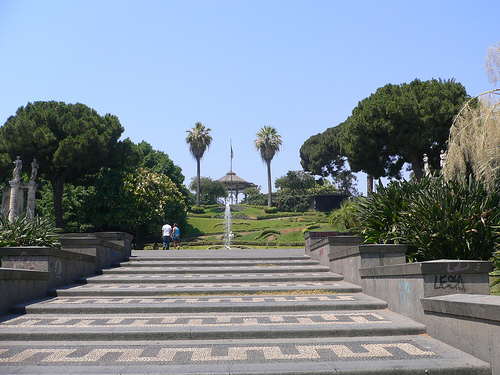 in the garden, the terraces are planted with mediterranean botanical specimens. and, a cane lined stream runs through the valley, which is cultivated with fruit and nut orchards, as well as citrus and olive groves. even the duomo in ortigia, an island connected to siracusa by bridge, is built around a doric temple from the 6th century BCE. the duomo was rebuilt in the baroque style following the earthquake in 1693, which destroyed much of eastern sicily. palermo architect, andrea palma, incorporated the doric columns from the greek temple into the baroque building. so, the columns now frame the some of the duomo’s lateral chapels. we only visited eastern and southern sicily. so, we didn’t go to selinunte or segesta, which are located in western sicily. that gives us one more reason to plan another sicilian holiday!